Updated: This page has been updated here for November 2017. Each temple has its own unique characteristics. 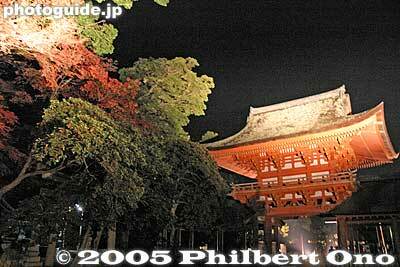 Saimyoji’s main temple and pagoda are both National Treasures that you can enter. 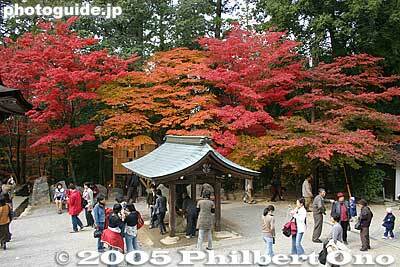 It’s also deservedly one of Japan’s 100 Grand Autumn Foliage Sites. Kongorinji has many colorfully dressed Jizo statues and a National Treasure main temple housing an 11-faced Kannon statue and 13 other statues that are Important Cultural Properties. Hyakusaiji is famous for giant straw sandals on a gate and a Japanese garden. Established by Shotoku Taishi in 609, Hyakusaiji is Shiga Prefecture’s oldest temple and one of Japan’s oldest. The Hondo temple hall has an 11-faced Kannon statue carved by Shotoku Taishi, a prince credited with spreading Buddhism in Japan. Each temple charges admission of ¥600 for adults. During the autumn foliage season from November 19–27, 2016, convenient, low-cost shuttle buses (Koto Sanzan Shuttle Bus) run every day between these three temples and Hikone Station and Yokaichi Station. You can either start at Hikone Station or Yokaichi Station. At Hikone Station, the first shuttle bus leaves at 9 am and goes to Saimyoji first. From Yokaichi Station, you can get on the first (and only) shuttle bus at 9:45 am to go to Hyakusaiji. It will take most of the day to see all three temples so start as early as you can in the morning. 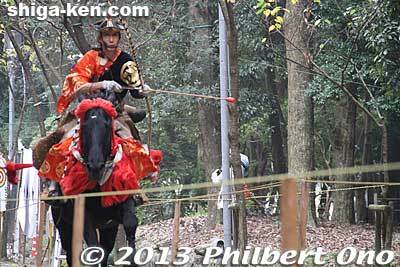 Another option is to also see Eigenji temple in Higashi-Omi. Being a Zen Buddhist temple, it’s not part of the Koto Sanzan Trio, but it is near Hyakusaiji and also famous for autumn leaves. You can either visit Eigenji first by taking a bus from Yokaichi Station, or visit it last after Hyakusaiji. I recommend starting from Hikone Station so you’ll work your way south by visiting Saimyoji first, then Kongorinji and Hyakusaiji (see shuttle bus schedule below). If you have time, you can take a local bus from Hyakusaiji to Eigenji. If you don’t have time, from Hyakusaiji, you can take the shuttle bus back to Hikone Station (last bus at 4:50 pm) or to Yokaichi Station (last bus at 5 pm). From Yokaichi Station, you can take the Ohmi Railways to JR Omi-Hachiman Station. Bus fare is ¥200 to ¥600 per ride depending on the distance. They also offer a day pass called Momiji kippu (Maple ticket) for ¥1,800 (¥900 for kids). This day pass includes passage on the shuttle buses and local buses to/from the train stations to the three Koto Sanzan temples and Eigenji and Ohmi Railways trains between Yokaichi and Omi-Hachiman Stations. A good deal if you plan to ride on Ohmi Railways. The Momiji kippu day pass is sold at Hikone Station (west exit bus stop), Omi-Hachiman Station (Ohmi Railways ticket office), and Yokaichi Station. If you like to take your time (for photography, etc. ), you might not have time to see all three temples in one day. There are also guided tour buses (teiki kanko bus) departing Nagahama, Kyoto, Maibara, and Hikone Stations that are much more expensive (around ¥8,000) and follow a set tour schedule. The shuttle buses allows you a more flexible schedule, but just remember what time the last bus leaves. *From Eigenji, buses bound for Yokaichi Station leave once or twice an hour until 8:27 pm on weekdays or 7:16 pm on weekends and holidays. This event is not in Shiga, but in Osaka. 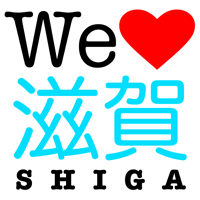 It’s a Shiga products fair where you can taste and buy stuff from Shiga. There will also be stage entertainment such as mascots from Shiga. Hiko-nyan is scheduled to appear on Nov. 8 at 11:30 am and 2 pm. Crafts people will also demonstrate the making of Omi-jofu hemp cloth and Hikone Buddhist altars. Koto Sanzan (湖東三山) is a trio of large Tendai Buddhist temples in eastern Shiga: Saimyoji (西明寺) in Kora, Kongorinji (金剛輪寺) in Aisho, and Hyakusaiji (百済寺) in Higashi-Omi. 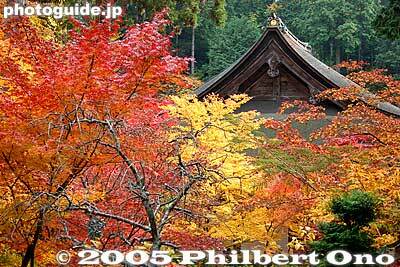 They are famous for autumn leaves and structures that are National Treasures or Important Cultural Properties. Each temple also has its own unique characteristics. Saimyoji has a National Treasure Hondo worship hall and National Treasure pagoda that you can enter. 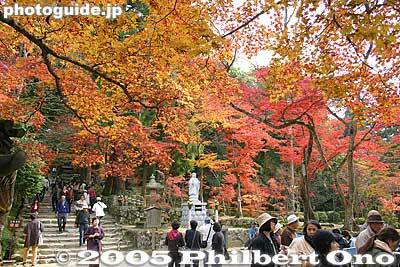 It’s also deservedly one of Japan’s 100 Grand Autumn Foliage Sites. Kongorinji has many little Jizo statues and a National Treasure Hondo main hall housing an 11-faced Kannon statue and 13 other statues that are Important Cultural Properties. It is also displaying Japan’s oldest Daikokuten statue until Nov. 30, normally hidden from view. It’s 1,200 years old. Hyakusaiji is famous for giant straw sandals on a gate and a Japanese garden. Established by Shotoku Taishi in 609, Hyakusaiji is Shiga Prefecture’s oldest temple and one of Japan’s oldest. The Hondo temple hall has an 11-faced Kannon statue carved by Shotoku Taishi, a prince credited with spreading Buddhism in Japan. During this period, convenient shuttle buses (Koto Sanzan Shuttle Bus) run every day between these three temples and a few train stations. The shuttle buses run most frequently from north to south, that is, from Saimyoji to Kongorinji and then to Hyakusaiji. If you start from the north, board the shuttle bus at Hikone Station. The bus will take you to Taga Town Hall from which you transfer to a bus bound for Saimyoji first. From the south, board the bus at Ohmi Railways Yokaichi Station. The bus will stop at Hyakusaiji first. (A different bus also goes to Eigenji.) Check the bus stop for bus departure times. After touring Saimyoji (or Hyakusaiji), catch another shuttle bus to the next temple. Shuttle buses also run from Hyakusaiji to Eigenji (listed below), another temple famous for foliage. From Saimyoji, the last shuttle bus leaves at 5:23 pm for Taga Town Hall where you can catch a bus to Hikone Station (or walk to Taga Taisha-mae Station). From Hyakusaiji and Eigenji, buses go to Ohmi Railways Yokaichi Station. From Hyakusaiji, the last shuttle bus leaves at 4:30 pm for Ohmi Railways Yokaichi Station arriving at 5 pm. Note that from this year, shuttle buses will not run from Amago Station and Kawase Station. Bus fare is 200 yen per ride which is only 10-20 min. They also offer a day pass called Momiji kippu (Maple ticket) for 1,800 yen. This day pass includes passage on all Koto Sanzan shuttle buses and all Ohmi Railways trains. A good deal if you plan to ride on Ohmi Railways. Each temple also charges admission of 500 yen. Note that if you like to take your time, you might not be able to see all three temples in one day. Established in 717 (Nara Period), Hyozu Taisha Shrine has a noted Japanese garden with a pond ringed by small rolling hills and autumn leaves. The fall leaves certainly look colorful and impressive when illuminated in the evenings and reflected in the pond. 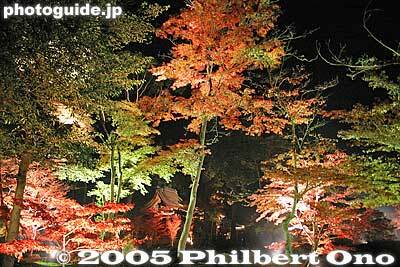 Mini concerts will be held during the foliage illumination in the evenings. The temples are Jorakuji 常楽寺, Chojuji 長寿寺, and Zensuiji 善水時. Jorakuji has not one, but two buildings that are National Treasures: the Hondo main hall and three-story pagoda. 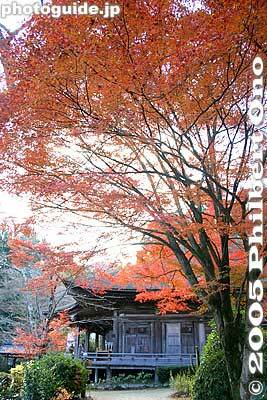 Chojuji means, “Long Life Temple,” and its small, but distinctive Hondo hall is a National Treasure. 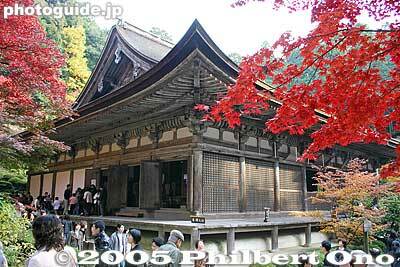 Zensuiji has the largest and most impressive Hondo hall (National Treasure) bearing elegant roof lines. Not to be missed by architectural buffs. The three temples are all in quiet, rural neighborhoods. Dramatic sight of hot-air balloons crossing Lake Biwa. 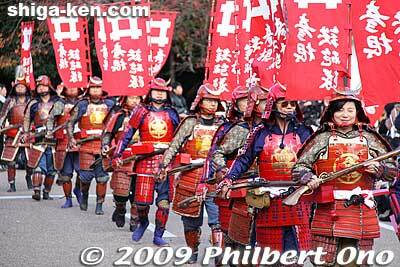 They start off very early in the morning so you would have stay near the launching beach in Takashima. Note that weather conditions can cancel the event. The famous Tonda Ningyo Bunraku puppet troupe will perform three acts. Admission 1,200 yen at the door. 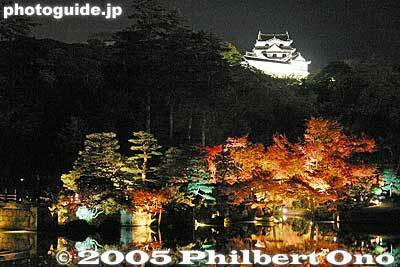 Recommended festivals, events, exhibitions, and autumn leaves in Shiga Prefecture in November 2013. (Most official Web sites are in Japanese only.) Compiled by Philbert Ono. Kunimasu trout at Lake Biwa Museum. A special and rare exhibit (the first in western Japan) of live kunimasu trout (Oncorhynchus kawamurae or black kokanee), previously thought to have gone extinct in the 1940s. Kunimasu was an endemic fish found only in Lake Tazawa in Akita Prefecture, but became extinct (along with most other fish species in the lake) in the 1940s when the water became too acidic. The acidic water came from nearby Tamagawa hot springs. In 1940, they allowed the hot spring’s highly acidic water to flow into the lake for a hydroelectric power plant and for diluting the hot spring’s acidity. The war effort was Japan’s top priority at the time, and they didn’t care about the environment and some fish becoming extinct. A far cry from today. The lake still has not fully recovered from its acidic water. In 1930, kunimasu fish eggs were sent to a number of lakes in Nagano, Yamanashi, and Toyama Prefectures as an experiment to see if they could be hatched and bred artificially. 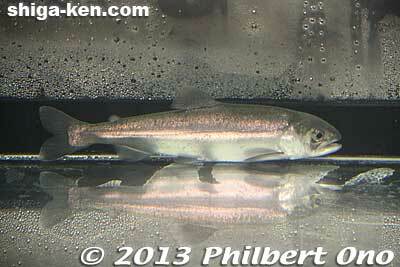 Sending fish eggs to other places was done to increase stocks of food fish. In 1935, the eggs were sent to Lake Saiko and Lake Motosu near Mt. Fuji and even to Shiga Prefecture’s Samegai Trout Farm in Maibara. The hatching experiment was deemed to have failed since no kunimasu were ever caught outside Lake Tazawa. In 1997-98, the Lake Tazawa Tourist Association offered a 5 million yen cash reward for any kunimasu caught in Japan. But no luck. Then in 2010, Kyoto University professor Nakabo Tetsuji (中坊 徹次) requested a fish fanatic celebrity and illustrator, nicknamed Sakana-kun, to draw an illustration of a kunimasu. To help him draw this “extinct” fish, Sakana-kun had people send him specimens of himemasu (Oncorhynchus nerka or kokanee) which is a close relative of kunimasu. Then one fish sent from Lake Saiko in Yamanashi Prefecture caught Sakana-kun’s attention since it looked like kunimasu. He sent it to Professor Nakabo who examined and checked the DNA. He and his research team confirmed it to be kunimasu in mid-December 2010. They announced the find to the press and it was Japan’s fish story of the century. It turned out that fishermen at Lake Saiko had been catching kunimasu all along, but called it kuromasu because it turned black (kuro means “black”) before spawning. It was relatively common to catch even among sport fishermen. People who dared to eat the black fish found it to be very delicious. Lake Saiko now retricts fishing in areas where the deep-water kunimasu is thought to dwell. And Lake Tazawa is working to cleanse its acidic water to allow kunimasu back to its original home. Five artificially-hatched kunimasu are displayed in the Lake Biwa Museum aquarium’s special exhibition room. Museum admission for adults is 750 yen (kids free), but it will be free for all on Nov. 16-17 as part of Kansai Culture Day when most museums in Shiga and neighboring prefectures will be free. Japan’s largest dotaku bell in Yasu. Yayoi no Mori Foliage Illumination on Nov. 15, 16, 17, 19, 20, 21, 22, 23, and 24 at 5:45 pm – 9 pm (enter by 8:30 pm). 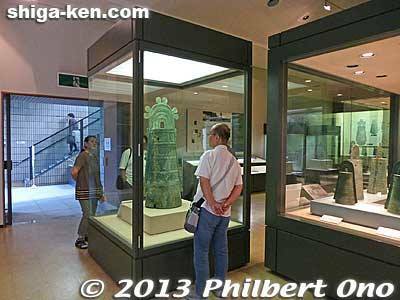 A very special and rare exhibit of Japan’s largest ancient bronze bell (called dotaku) found near the museum in Yasu. The bell, designated as an Important Cultural Property, is owned by the Tokyo National Museum where it is normally exhibited. This is the first time this bell will be exhibited in its hometown of Yasu since it was unearthed in 1881. A smaller dotaku on loan from the Tokyo National Museum and numerous replica dotaku bells are also on display. On Aug. 20, 1881, two young lads were playing on nearby Mt. Oiwa when they stumbled across three dotaku bells partially exposed in the ground. The next day, eleven more dotaku were discovered in the same area. The bells are dated from around 100 BC to 300 AD (Japan’s Yayoi Period). The bells were not really used as bells. They were more for decorative and religious purposes. Two of the dotaku were acquired by the Tokyo National Museum. The remaining dotaku were scattered among various people. Their whereabouts were unknown until an investigation found 12 of them at temples and Japanese and overseas museums. It’s frustrating that none of the original dotaku discovered in Yasu are in Yasu. Another case of bungling and ineptness by local officials who couldn’t recognize a good thing when they saw it. Near the museum, there’s a monument where the large bell was found. Yasu’s official mascot, Dotaku-kun, is modeled after this bell. Also, the museum has Yayoi no Mori, an outdoor display of Yayoi-Period grass shacks and garden of autumn foliage that will be illuminated in the evening on the days listed above. The museum will also be open till 9 pm on Nov. 16-17. 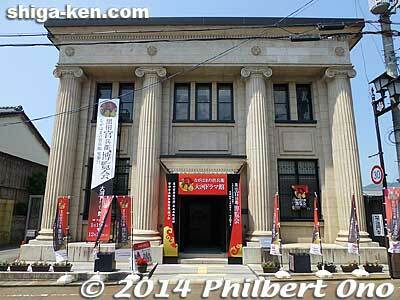 Museum admission 200 yen for adults. Free admission for Yasu residents and free for all on Nov. 16-17 for Kansai Culture Day. Awesome display of ground fireworks from masters all over Japan. If seeing fireworks in summer is too hot for you, this would be good. Free admission. Koto Sanzan (湖東三山) is a trio of large Tendai Buddhist temples in eastern Shiga: Saimyoji (西明寺) in Kora, Kongorinji (金剛輪寺) in Aisho, and Hyakusaiji (百済寺) in Higashi-Omi. 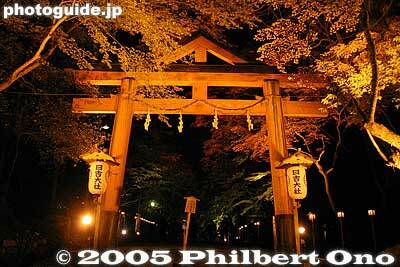 They are famous for autumn leaves and structures that are National Treasures or Important Cultural Properties. Each temple also has its own unique characteristics. Saimyoji has a National Treasure Hondo worship hall and National Treasure pagoda that you can enter. It’s also deservedly one of Japan’s 100 Grand Autumn Foliage Sites. Kongorinji has many little Jizo statues and a National Treasure Hondo main hall housing an 11-faced Kannon statue and 13 other statues that are Important Cultural Properties. Hyakusaiji is famous for giant straw sandals on a gate and a Japanese garden. Established by Shotoku Taishi in 609, Hyakusaiji is Shiga Prefecture’s oldest temple and one of Japan’s oldest. The Hondo temple hall has an 11-faced Kannon statue carved by Shotoku Taishi, a prince credited with spreading Buddhism in Japan. During this period, convenient shuttle buses (Koto Sanzan Shuttle Bus) run every day between these three temples and a few train stations. The shuttle buses run most frequently from north to south, that is, from Saimyoji to Kongorinji and then to Hyakusaiji. Board the shuttle bus at JR Kawase Station or Ohmi Railways Amago Station. The bus will stop at Saimyoji first. Check the bus stop for bus departure times. After touring Saimyoji, catch another shuttle bus to the next temple, Kongorinji, and then Hyakusaiji. 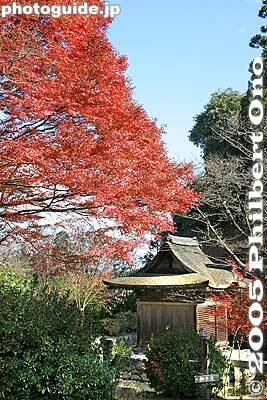 Shuttle buses also run from Hyakusaiji to Eigenji (listed below), another temple famous for foliage. From Hyakusaiji and Eigenji, buses go to Ohmi Railways Yokaichi Station. Buses depart once or twice an hour from 9:10 am at Kawase Station and 9:20 am at Amago Station. 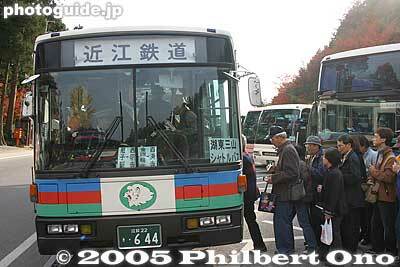 From Hyakusaiji, the last shuttle bus leaves at 4:35 pm for Ohmi Railways Yokaichi Station arriving at 5 pm. Or you can catch the 5 pm shuttle bus for Amago Station (arrive 5:46 pm) or Kawase Station (arrive 5:56 pm). If you want to go from south to north, catch the shuttle bus at Ohmi Railways Yokaichi Station at 9:35 am and get off at Hyakusaiji. From Saimyoji, the last shuttle bus leaves at 5:33 pm for Ohmi Railways Amago Station and JR Kawase Station. Buses also run between Ohmi Railways Taga Taisha-mae Station and Saimyoji. See the bus schedule here (in Japanese). Bus fare is 200 yen per ride which is only 10-20 min. They also offer a day pass called Momiji kippu (Maple ticket) for 1,650 yen. This day pass includes passage on all Koto Sanzan shuttle buses and all Ohmi Railways trains. A good deal if you plan to ride on Ohmi Railways. Each temple also charges admission of 500 yen. Note that if you like to take your time, you might not be able to see all three temples in one day. Eigenji in autumn. Hondo on right. Hyozu Taisha Shrine in autumn.